On a sunny, bright blue day in May, I stood on the bluff in the small Italian town of Ventimiglia with my toes just over the edge of the cliff overlooking the aquamarine Mediterranean Sea. After covering the Cannes Film Festival for two weeks I had a free day and took the scenic train from the town of Cannes to Monaco (where I, along with several Monegasques lit candles in the small stone Saint Devote chapel) and then on to this ancient, extraordinary rustic Italian town just over the border from France. It was the kind of day you carry with you your entire life. When I got off the train I smelled the salty, midnight blooming jasmine-filled air of this town on the sea. I lucked out in that there was a farmer's market that day. I walked towards the music. And it was on that day that I enjoyed the best meal I have ever had. I found a small trattoria with an outdoor patio. Sitting under olive and lime trees I stared out at the sea sipping a fresh squeezed limeade. The cameriere brought me a Caprese sandwich- a fresh warm panino with a thick cool, creamy slice of mozzarella cheese, a slice of bright red heirloom pomodoro piled high with bright green basilico leaves seasoned with olio and aceto. I almost cried from the Happy of the moment. Blue sky, warm sun, azure sea to my left and the cathedral ruins on the hills to my right. This moment stuck in my head as one of the happiest moments in my life. 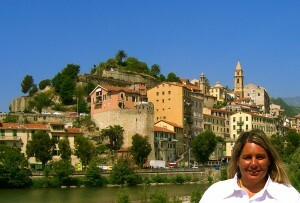 Last week when I was going through an epiphany I thought of this beautiful day in Italy and The Happy Girl Experiment. Then to keep my head busy so I would stop thinking of the possible bad news from my doctor, I watched "Eat Pray Love" again and the scenes in Italy just made me so happy as I watched Julia Roberts say Attraversiamo over and over again during a dinner scene (35 minutes into the movie. In fact I am watching this film as I write this now!) In my newfound "Let's go for it!" attitude I decided to do something about this memory. I was going to learn the language. I went online and found a class was starting at a local college in just a couple days. (Serendipity, hunh?) Without giving myself time to think about "Should I do this? I have no reason to take an Italian class. Do I have time to take this class?" I called and registered. Yesterday was my first day of school. I was so excited. The lovely Sardinian Professoressa breezed in. "Ciao! Ciao!" she said as she commandeered the room with her energy. After an introduction she said "I am handing out these placards. Please write your name and title on the card that will sit on your desk. Be whatever you'd like! I like being referred to as 'Your Majesty'" she giggled. I thought "OK, she's your majesty, I'll be a Principessa!" When we had all propped our name placards on our desk we looked around at everyone else's names. This is when I saw that my classmates used the titles Singor and Signora and their names. There was no time to change my placard especially since I wrote Principessa Taylor on one side and Principessa Johnson on the other side once the Professoressa told us that in Italy it is custom to use someone's last name , not their first name. So basically I goofed twice. I wondered if my Italian dictionary translated the word "Oops!" The first impression my fellow classmates had was of me thinking of myself as an Italian Princess. Wonderful. I got home and told my husband I now have the language skills of an Italian three-year-old. I knew how to say my name and my ABC's in Italian. Bonus: I learned how to make a faux pas in Italian as well! I was beating myself up yesterday afternoon thinking "Geez, my fellow classmates must think I am an idiot." Then I thought "chill." 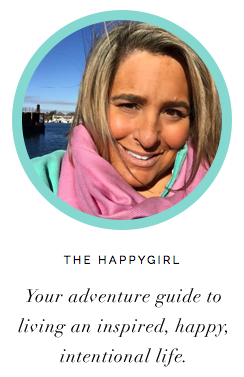 What did I learn about Happy last week? LIFE IS AMAZING, SAVOR EVERY MOMENT, TAKE ADVANTAGE OF WHAT LIFE HAS TO OFFER. So I let it go and I thought "Clearly my sense of fun and my sense of humor are coming back. These are good steps to getting my Happy back, right?!" 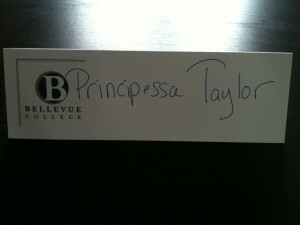 I decided next week I will display my Principessa Taylor placard just as it is. Why? Because seeing what I wrote on that placard reminded me that my sense of fun is still intact and I am indeed starting to get my Happy back. I felt a little lighter and even a little bit of that bliss I experienced that May day in Ventimiglio. Oh, and here's a funny Italian phrase I found this morning when I was doing my homework. I wonder why on earth one might need this phrase? !